Smoky, juicy and meaty, these drumsticks from Burnt Finger BBQ will have you clamoring for more. Seasoned with a smoky Kansas City rub and slow roasted, they make a great snack or part of a filling meal. They come already cooked in a resealable bag, so eat what you want and save the rest for later. 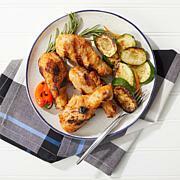 How about BBQ chicken for dinner tonight? Can be stored in your freezer for up to a year. Drumsticks come frozen and fully cooked. Just re-heat in the oven, on your grill, in the microwave or in an air fryer. Can be heated from frozen or thawed. I placed four drumsticks right from freezer (removing wrap), and placed in my air-fryer. The chicken had the right touch of fried and moist, tender meat. The meat is tender and moist. I also have the Kansas City BBQ sauce that amped up the spices and a wow flavor. Highly recommend; glad I ordered this on auto-ship. This is some of the best chicken that l have tasted. My only regret is that I didn't get them on auto ship. These are meaty and flavorful and worth every penny! Put them in my small convection oven and they were done in 20 minutes and they were so good!!!! Will order again! !